Pyogenic spinal infections most commonly are caused by Staphylococcus aureus (in 60% of patients) and Enterobacter species (in 30% of patients). Osteomyelitis caused by Salmonella is most often seen in patients with sickle cell disease. Pseudomonas aeruginosa, Serratia species, and Candida species most often affect patients with a history of intravenous drug abuse. Mycobacterium tuberculosis causes most nonpyogenic spinal infections; however, fungi (eg, Cryptococcus species, Aspergillus species, coccidioidomycosis) also may cause infections. [1, 7, 8, 9, 2] The characteristics of spondylodiskitis as they appear on radiographs, computed tomography (CT) scans, and magnetic resonance imaging (MRI) scans are demonstrated in the images below. Fluoroscopy-guided radiograph shows how disk aspiration may be used to direct an image-guided procedure. This image also demonstrates the relatively subtle changes of spondylodiskitis on radiography. Although early loss of the disk space may be present, no definite endplate erosion is seen. MRI findings were supportive of infection; the biopsy was culture positive for Staphylococcus aureus. This image of a CT-guided biopsy of diskitis/osteomyelitis demonstrates extensive destruction and fragmentation of the vertebral body resulting from spondylodiskitis. CT-guided percutaneous needle aspiration and biopsy were performed to obtain material for cultures to direct appropriate antibiotic therapy. 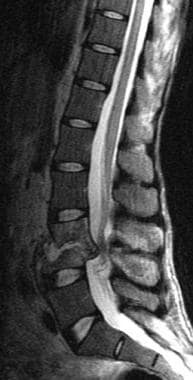 Diskitis/osteomyelitis is seen on this T2-weighted MRI of the lumbar spine, which demonstrates destruction of the L3-4 disk space with the adjacent endplate and/or vertebral body. L3 and L4 vertebral bodies show increased T2 signal, indicating edema and/or infarction. Also shown is a retropulsion of debris, which compresses the thecal sac. Although plain images, radiographs, CT scans, and nuclear medicine studies can help to establish the diagnosis of spondylodiskitis, MRI is considered the modality of choice for evaluating the presence and severity of spinal infection. MRI is especially effective for evaluating the neural structures of the spine (ie, spinal cord, nerve roots) and extradural soft tissue. CT scanning is most useful for characterizing vertebral osteomyelitis in patients with subacute or chronic illness. CT scanning provides radiologic guidance for interventional procedures (ie, biopsy, drainage). MRI is relatively expensive. In addition, it is contraindicated in patients with certain implanted medical devices (eg, pacemakers), and it is not tolerated by all patients because of claustrophobia or morbid obesity. Good MRIs require the cooperation of the patient; the quality of MRI is degraded by motions of the patient. Use of a gadolinium-based intravenous contrast agent is strongly recommended. Gadolinium-based contrast agents have been linked to the development of nephrogenic systemic fibrosis (NSF) or nephrogenic fibrosing dermopathy (NFD). For more information, see the eMedicine topic Nephrogenic Systemic Fibrosis. NSF/NFD has occurred in patients with moderate to end-stage renal disease after being given a gadolinium-based contrast agent to enhance MRI or MRA scans. Characteristics include red or dark patches on the skin; burning, itching, swelling, hardening, and tightening of the skin; yellow spots on the whites of the eyes; joint stiffness with trouble moving or straightening the arms, hands, legs, or feet; pain deep in the hip bones or ribs; and muscle weakness. For more information, see FDA Information on Gadolinium-Based Contrast Agents or Medscape. CT scanning is quick and inexpensive, although it exposes the patient to ionizing radiation. In addition, it is associated with a low risk of an allergic reaction to the intravenous contrast agent, though detection of bone destruction or a paraspinal mass does not require the use of contrast material. Radionuclide studies may be time consuming, and spatial resolution may be low. With plain radiographs, results are often normal or nonspecific in patients with acute spinal infection. Plain radiographic findings suggestive of subacute or chronic spondylodiskitis, such as disk-space loss, endplate erosion, and vertebral sclerosis, should be correlated with the patient's clinical history. In cases of spondylodiskitis, radiographic findings lag behind clinical response to treatment by approximately 1 month. In spondylodiskitis, CT scans may appear normal early in the course of disease. Disk-space narrowing or decreased attenuation in the disk is often the earliest manifestation of disease. After the administration of iodinated contrast material, the abnormal disk space, vertebral marrow, or paravertebral soft tissues may enhance. Overall, CT scanning is more sensitive (68%), more specific (97%), and more accurate (80%) than plain radiography in identifying areas of vertebral osteomyelitis in animal models. Because of its ease and speed of use, lower cost, and availability, CT scanning is an excellent method for evaluating the bony changes of spondylodiskitis and for directing radiologic intervention (ie, aspiration or biopsy; see the image below) in spinal infections. In the diagnosis of active bacterial disk-space infections, the sensitivity and specificity of CT-guided percutaneous aspiration may be as high as 91% and 100%, respectively; however, percutaneous aspiration is less reliable in the diagnosis of nonbacterial infections. Gas in the disk space (ie, vacuum phenomenon) may occasionally be observed on CT scans. Although this finding is most often associated with degenerative disk disease, it may also occur with infection. CT scanning is less sensitive than MRI in depicting soft tissue structures, but its sensitivity may be improved with the use of intravenous contrast material. Paraspinal and epidural abscesses generally appear isointense to muscle on T1-weighted images and hyperintense on fat-saturated T2-weighted or short-tau inversion recovery (STIR) images. Abscesses of the vertebral body may appear more conspicuous on diffusion-weighted images (DWIs) than on conventional T1- or T2-weighted images. 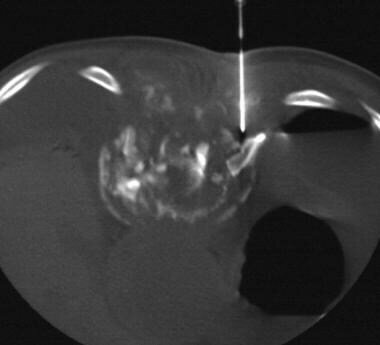 On contrast-enhanced MRIs, an epidural abscess may appear as an area of peripheral enhancement (as seen in the image below) surrounding an area of fluid signal intensity; it may also appear as an area of abnormal enhancement of disk, vertebral marrow, or paraspinal soft tissue. The epidural abscess on this contrast-enhanced T1-weighted MRI demonstrates the loss of disk-space height, which is most prominent at C4-5 and C5-6. A large, peripherally enhancing epidural abscess extends from C5-6 to the C2 level. The thecal sac and cord are compressed. Signal and enhancement changes may persist after clinical resolution of the infection; such findings gradually decrease over weeks to months. This illustrates the fact that contrast enhancement is not always indicative of active infection. These changes do not occur as rapidly as with gallium scanning. False-negative findings may occur in patients with spondylodiskitis caused by organisms of low virulence (eg, diphtheroids, coagulase-negative staphylococci). The usefulness of ultrasound is limited in spondylodiskitis. Occasionally, ultrasonography may be useful for localizing large paraspinal fluid collections for purposes of aspiration and/or drainage. Color Doppler sonography may show areas of hyperemia surrounding abscesses. Nuclear scintigraphy is sensitive for vertebral osteomyelitis; however, increased bone turnover from surgery, fracture, or degenerative changes decreases specificity. False-negative results may occur when atherosclerosis or primary bone destruction compromises blood flow to a lesion. Use of 111In WBCs may increase the specificity of bone scanning; however, the images may be falsely negative in patients with chronic osteomyelitis or falsely positive in patients with inflammatory or reactive conditions such as rheumatoid arthritis and fractures. Friedman JA, Maher CO, Quast LM. Spontaneous disc space infections in adults. Surg Neurol. 2002 Feb. 57(2):81-6. [Medline]. Tyler KL. Acute pyogenic diskitis (spondylodiskitis) in adults. Rev Neurol Dis. 2008 Winter. 5(1):8-13. [Medline]. Young A, Tekes A, Huisman TA, Bosemani T. Spondylodiscitis associated with button battery ingestion: prompt evaluation with MRI. Neuroradiol J. 2015 Oct. 28 (5):504-7. [Medline]. Pee YH, Park JD, Choi YG, Lee SH. 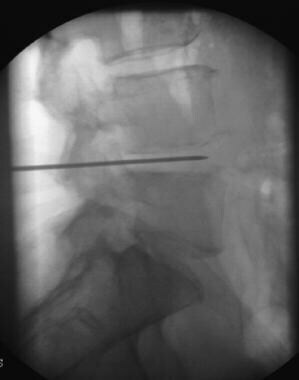 Anterior debridement and fusion followed by posterior pedicle screw fixation in pyogenic spondylodiscitis: autologous iliac bone strut versus cage. J Neurosurg Spine. 2008 May. 8(5):405-12. [Medline]. Cottle L, Riordan T. Infectious spondylodiscitis. J Infect. 2008 Jun. 56(6):401-12. [Medline]. Principi N, Esposito S. Infectious Discitis and Spondylodiscitis in Children. Int J Mol Sci. 2016 Apr 9. 17 (4):[Medline]. Honan M, White GW, Eisenberg GM. Spontaneous infectious discitis in adults. Am J Med. 1996 Jan. 100(1):85-9. [Medline]. Smith AS, Blaser SI. Infectious and inflammatory processes of the spine. Radiol Clin North Am. 1991 Jul. 29(4):809-27. [Medline]. Weinberg J, Silber JS. Infections of the spine: what the orthopedist needs to know. Am J Orthop. 2004 Jan. 33(1):13-7. [Medline]. Dziurzynska-Bialek E, Kruk-Bachonko J, Guz W, Losicki M, Krupski W. Diagnostic difficulties resulting from morphological image variation in spondylodiscitis MR imaging. Pol J Radiol. 2012 Jul. 77(3):25-34. [Medline]. [Full Text]. Juhl JH, Crummy AB, Paul LW. Paul and Juhl's Essentials of Radiologic Imaging. Philadelphia, PA:. Lippincott-Raven. 1998:173-97. Lucio E, Adesokan A, Hadjipavlou AG, et al. Pyogenic spondylodiskitis: a radiologic/pathologic and culture correlation study. Arch Pathol Lab Med. 2000 May. 124(5):712-6. [Medline]. Osborn AG. Diagnostic Neuroradiology. St Louis, MO: Mosby-Year Book. 1994: 820-6. Resnick D. Bone and Joint Imaging. 2nd ed. Philadelphia, PA:. WB Saunders. 1996: 674-83. Ross JS. Diagnostic Imaging, Spine. Amirsys. 2004. III-1-2:III-1-33. Rothman MI, Zoarski GH. Imaging basis of disc space infection. Semin Ultrasound CT MR. 1993 Dec. 14(6):437-45. [Medline]. Sklar EML, Post MJD, Lebwohl NH. Imaging of infection of the lumbosacral spine. Neuroimaging Clin N Am. 1993. 3:577-90. Vcelák J, Tóth L. [Surgical treatment of spondylodiscitis]. Acta Chir Orthop Traumatol Cech. 2008 Apr. 75(2):110-6. [Medline]. Chew FS, Kline MJ. Diagnostic yield of CT-guided percutaneous aspiration procedures in suspected spontaneous infectious diskitis. Radiology. 2001 Jan. 218(1):211-4. [Medline]. Boden SD, Davis DO, Dina TS, et al. Postoperative diskitis: distinguishing early MR imaging findings from normal postoperative disk space changes. Radiology. 1992 Sep. 184(3):765-71. [Medline]. 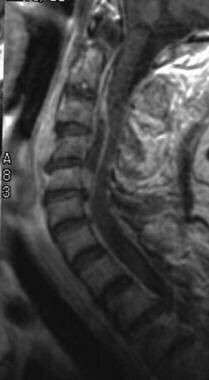 Friedmand DP, Hills JR. Cervical epidural spinal infection: MR imaging characteristics. AJR Am J Roentgenol. 1994 Sep. 163(3):699-704. [Medline]. Ledermann HP, Schweitzer ME, Morrison WB, Carrino JA. MR imaging findings in spinal infections: rules or myths?. Radiology. 2003 Aug. 228(2):506-14. [Medline]. Post MJ, Sze G, Quencer RM, et al. Gadolinium-enhanced MR in spinal infection. J Comput Assist Tomogr. 1990 Sep-Oct. 14(5):721-9. [Medline]. Sharif HS. Role of MR imaging in the management of spinal infections. AJR Am J Roentgenol. 1992 Jun. 158(6):1333-45. [Medline]. Eastwood JD, Vollmer RT, Provenzale JM. Diffusion-weighted imaging in a patient with vertebral and epidural abscesses. AJNR Am J Neuroradiol. 2002 Mar. 23(3):496-8. [Medline]. Wilson MA. Textbook of Nuclear Medicine. Philadelphia, PA:. Lippincott Williams and Wilkins. 1997:198-204. Fuster D, Tomás X, Mayoral M, Soriano A, Manchón F, Cardenal C, et al. Prospective comparison of whole-body (18)F-FDG PET/CT and MRI of the spine in the diagnosis of haematogenous spondylodiscitis. Eur J Nucl Med Mol Imaging. 2015 Feb. 42 (2):264-71. [Medline]. Nakahara M, Ito M, Hattori N, Magota K, Takahata M, Nagahama K, et al. 18F-FDG-PET/CT better localizes active spinal infection than MRI for successful minimally invasive surgery. Acta Radiol. 2015 Jul. 56 (7):829-36. [Medline]. Smids C, Kouijzer IJ, Vos FJ, Sprong T, Hosman AJ, de Rooy JW, et al. A comparison of the diagnostic value of MRI and 18F-FDG-PET/CT in suspected spondylodiscitis. Infection. 2016 Jun 17. [Medline]. Fahnert J, Purz S, Javers JS, Heyde CE, Barthel H, Stumpp P, et al. The use of simultaneous 18F-FDG-PET/MRI for the detection of spondylodiscitis. J Nucl Med. 2016 May 19. [Medline]. Spread from an adjacent source, such as a psoas abscess, is an uncommon infection route in spondylodiskitis. These T2-weighted MRI scans show a large, right psoas abscess with epidural extension. Despite the large fluid collection, results of percutaneous biopsy were culture negative. The patient was treated with intravenous antibiotics before the procedure.